Alexa Routine is another way to control your home with just a single Alexa command. Apart from turning ON and OFF your Amazon Echo devices added in Alexa Groups, you can also ask them what to do on your commands. This means that when you ask Alexa to switch off or on the light, changing the light color, control thermostat according to room temperature, all she will do that on your single command. So, here we are going to show you how you can setup Alexa Routines and use it to make your home smarter than ever. You can easily start with Alexa Routine to make your home work with your way just with a single Alexa Routine Command. In a way to go with Alexa Routines all you need to have an Amazon Alexa App and Amazon Echo device successfully setup and connected to Alexa App. Going to show you some steps on how to setup Alexa Routine on Amazon Echo or other Echo devices. Step 5: After that you need to create a trigger. For that click on + icon show beside the option “When This Happens”. Step 6: At the time next screen will appear where you need to choose when and at which time this trigger will happens. Such like when you say some phrase, when you leave for office, when reached at home, when any other smart device takes an action or when just your press an Echo button. Step 7: This step depends on which option you have selected. For now we have selected “Schedule”. Next you need to select the specific time when does this routine should be activate. Step 8: You will see more options there like “Select Days”- Every Day, Weekdays, and Weekends. And another option is “Or Select a Day” that is from Monday to Sunday. Step 11: Another thing is to do is to add an action on created routine. For this tap on plus icon beside the “Add Action” option. Step 12: Now select an action which you want your Alexa to perform on specific routine. Action may be like “saying a phrase”, “playing music”, “reading news updates”, “checking weather”, and “setting an alarm or timer”, “sending messages”, “on any event” and many more action you can add to your Alexa routines. Smart device which you want to add to your Alexa Routine must be recognized by Amazon Alexa and it should be properly setup. When you select options “Smart Home” two options will appear that is “Control Device” and “Control Scene”. 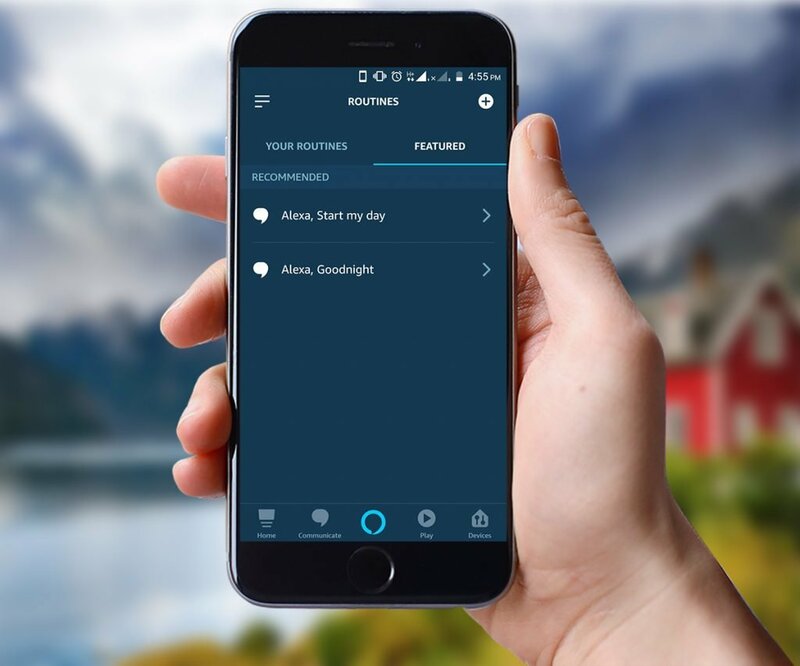 Select which smart device you want to control via Alexa Routines. Next to select is “what you want your smart device should do on your command”. Want to add some music to your created Alexa Routines? You can also add some music to your Alexa Routines of your choice. Next, search for the music you want to add to your Routine. Remember that you can add only one song to a specific Alexa Routine. After that a list of available music services provider will appear on your screen. Select any and also duration for how much time it should play for you once the Alexa Routine is active. If you use Spotify to stream music then here is a guide on “How to connect and play Spotify on Alexa”. Want your Alexa to say something too you when Routine is active? At last, select your device on which you want this phrase to play and press “Save” button.